Husain Abdulla, originally from Bahrain, is the founder and Executive Director of Americans for Democracy and Human Rights in Bahrain. 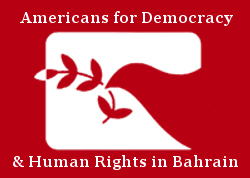 As Executive Director, Husain leads the organization’s efforts to ensure that US policies support the democracy and human rights movement in Bahrain. Husain also works closely with members of the Bahraini-American community to ensure that their voices are heard by US government officials and the broader American public. Husain holds a Master’s degree in Political Science and International Relations from the University of West Florida and a BA in Political Science and Mathematics from the University of South Alabama. Tyler leads ADHRB’s research and advocacy work on human rights abuses in Bahrain and the broader Gulf region and provides support to the organization’s broader programs. Tyler is a graduate of the London School of Economics where he received his Master’s degree in International Relations. He focused on the Middle East and the relationship between the state, power, and violence. Through his studies, he gained an interest in human rights. He hopes to pursue this interest by gaining further experience and continuing work on human rights and the issues of politics and violence relating to the Middle East. Bridget received a Bachelor’s degree in Political Science from the University of Louisville and a Juris Doctor from Salmon P. Chase College of Law at Northern Kentucky University. She recently completed a Latin Magister Legum (Master of Laws) in International Human Rights Law at the Irish Centre for Human Rights, where she focused on women’s rights and gender under international law, as well as International Humanitarian Law. Before joining the ADHRB team in November 2017, Bridget worked with United Nations institutions in Vienna and New York, including the United Nations Register of Damages Caused by the Construction of the Wall in the Occupied Palestinian Territory (UNRoD) and the Office for the Coordination of Humanitarian Affairs (OCHA). She is a licensed attorney in the state of Ohio. Monica received a Bachelor’s Degree from Brown University in International Relations with a focus on the Middle East region and human rights. She is particularly passionate about women’s and prisoner’s rights, and has completed in-depth research on honor-based violence and forced confessions. At ADHRB she works primarily on the human rights situation in Bahrain, creating and implementing domestic and international advocacy strategies. Laura supports ADHRB’s advocacy work through research and report-writing on human rights issues throughout the GCC region. Laura is a graduate of American University, where she received a B.A. in International Relations focusing in Development and Identity, Race, Gender & Culture. She has published work through Vanderbilt University’s Journal of International Affairs on informalization and gender bias in access to education. Prior to her time at ADHRB, she worked at the Arab American Institute and with the Center for Rights Education and Awareness in Nairobi, Kenya.